I have a theory about hamburger and hot dog buns. The lamer the filling, the thicker and emptier the bun to fill up your stomach and distract from a less then excellent sandwich. 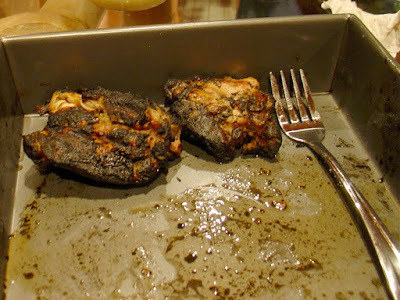 Flat, thin, fresh hot can not be substitute, and was the absolute center piece of a BBQ I threw on vacation. 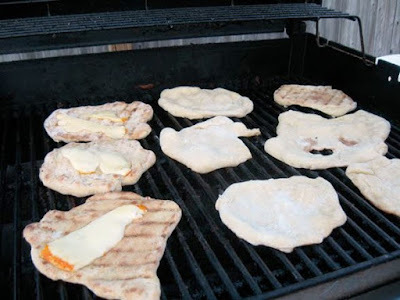 Flat bread can be prepared 1 hours to over night in advance, but cooked in a flash on the grill. Wrap it around burgers, grilled veggies, tofu, hot dogs, or served in wedges with dip. I melted cheese on mine and served it as side with some olive tapenade. Also great for brunch. Truly memorable for not a lot of effort. I like to poke through Polish groceries and meat stores. I've discovered many meat treats in the past in my local one on Church Ave in Brooklyn. Candy and sweets are secondary. Who knows what flavors lie below the colored cellophane. I write it off as the usual fruity/caramel/minty variety in foreign packaging. Lobster candy were clawing to go home with me. 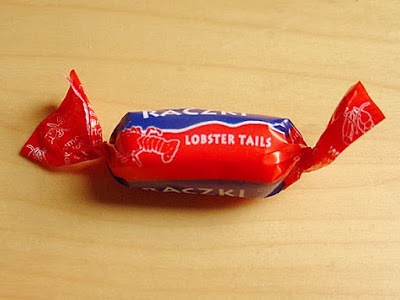 The package read "Lobster Tails, Cripsy Crunchy Candy, Raczek." I was hoping for something like the ocean in candy form, even if that would be pukescent. What I found was rum flavored candy that tasted remarkably like a sweeter egg nog, very near bubble gum flavor with a peanut finish. The texture is crispy on the outside and butterfingery on the inside. Its good, and its the closest thing I'm getting to lobster this summer! Good job Poland creating a Christmas flavored seafood themed candy. I will seek your lobster candy from now on along side your cold cuts. I haven't put much into Cantaloupe Alone. I have been "busy" sunning my self while dreaming up delightful things to grill up on my vacation on Fire Island. I grilled everyday. Sometimes 2-3 times a day. The propane was burning as early as 11 am, which is early for a no alarm clock vacation sleep schedule. I'm off to cook and grill by the sea. Goodbye for a few weeks until I'm back with some island food stories and a maybe a tan. Week 6 was had a little less to offer than week 5, but plenty of basil and heirloom tomatoes. Today was almost double what we've been getting and oh buddy did we ever get some tomatoes! Carrots have made a very early appearance in the season. I welcome them to my kitchen where they will last approximately 15 minutes before I eat them up. Please note my foolishness in biking to the CSA site to get my share. We have been getting 8-12 pounds of food recently. This week with 2 melons, chicken, and eggs the share was totaled about 30 plus pounds, which I strapped to my back in my daypack. It hurt every part of me to bike the mile home. Even now my spine is sending my brain distress signals. I'm lucky I didn't wobble over starting and stopping at lights. Am I a wuss or what? Finding healthy food in Taiwan isn't much different than in America. Just like in America the healthiest food isn't the one jumping off the shelf in a bright colored box or advertised on the side of a bus. You have to seek it. Moving to an Asian country, especially Taiwan, creates a large language barrier. It take some time and I'm here to give a little guidance and inspiration. What am I calling healthy? We could bounce ideas around for ages on that very subject. 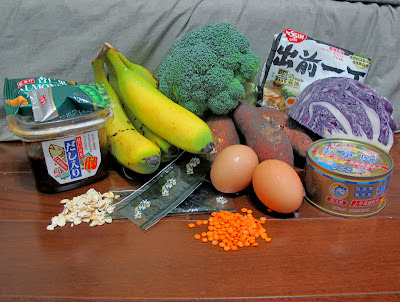 I am going to say a mostly "clean" diet of vegetables, fruit, lean proteins, complex carbohydrates is healthy. The foods here are mostly gluten-free, in case you are so disabled. I'm pointing out vegan and vegetarian options. 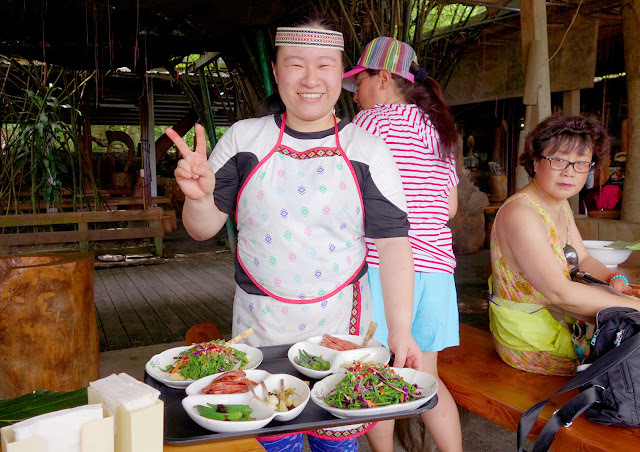 Taiwan loves its pork and seafood, but due to a high buddhist population there are tons of options for vegetarians and vegans. 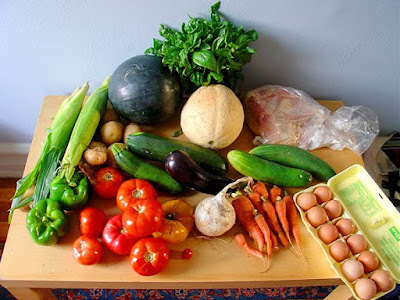 Without even trying most of these foods are found locally. Living on a small island encourages that! One of the biggest road blocks in my adventure to figure out what I've been eating here in Taiwan is nutrition labels. 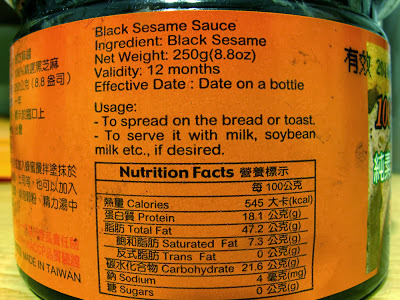 The labels offer similar nutritional information as the USA but not identically, and not in the same order, in Traditional Chinese, and serving sizes are metric. There are a few conversations on the age-old Formosaboards that offer some non-helpful tips, and some tips that are totally wrong. No, 7-11 does not list nutritional information in English, *sigh. I also ran across this very detailed but also confusing pamphlet from Hong Kong. Living in Taipei has changed me in ways I never could have predicted. I love buffets. 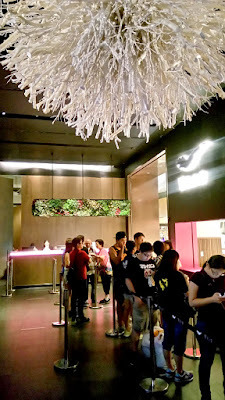 Buffets in Taiwan range from affordable to glamorously decadent. In America, a buffet was mostly a cattle call with troughs of macaroni salad, jello, and some meat-like foods. In Taiwan, it means lobsters, champagne, European cheese, sushi, and duck. Buffeting has become a hobby for my boyfriend and I. We've scoured the internet for photos and reviews and tried 8-10 so far. Yes, I have suffered from a few, but most all are a wonderful way to spend an evening. My family and I visited Taroko Gorge on Taiwan's East Coast near Hualien early May of 2017. The day was full of breath-taking views and fresh air. Possibly the most memorable stop on the trip was lunch. We hired a taxi driver for the day and when he suggested lunch at 達基力部落屋風味餐 (roughly Da Ji Li tribe restaurant in English) no one had any doubts it would be excellent. Taiwan has 14 different aboriginal tribes, totaling 533,600 people as of 2014. They have held on to their traditions and culture despite Taiwan's troubled past. I'm sorry to say I am not sure which tribe this restaurant represents. I need to confess. 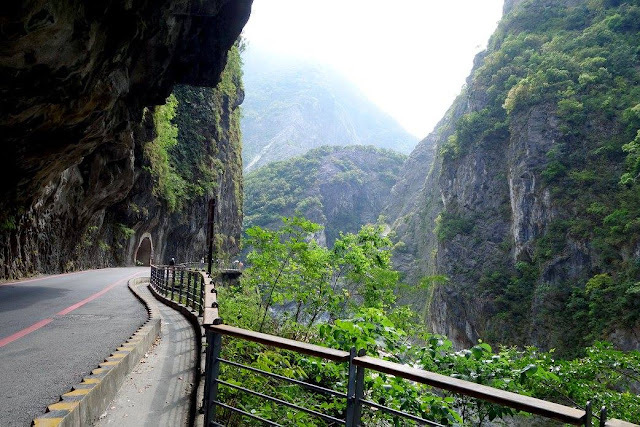 I've been living in Taiwan for 4.5 years now, and never visited the Taroko Gorge National Park, Taiwan's most famous tourist destination. I have been to its nearby city, Hualien, but never the sweet spot. Because it is most often mentioned on all the most very touristy lists, I wrote it off as too far to get to for too little payoff. I assumed it would be an amazing view worthy of 10 minutes of photo taking crowded with tourists, and not an entire park filled with natural wonder and options. Wrong, wrong, wrong. Meat balls stuffed with meat. 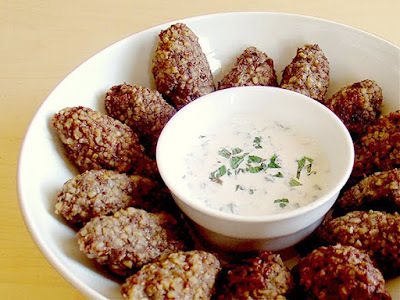 Kibbeh is definitely a recipe that kicks around the Middle East going by a more than one name. Kibbe, kebeh, quibe, kubbeh, or even torpedo and fried footballs (as they are called in my grandmother's cookbook) are all common tags for the dish. The Arabic translation (kubbah) means ball, so there you have a Middle Eastern meatball. Prepared with ground lamb or beef, seasoned with onions, allspice, mint, and pine nuts, and made fluffy with bulgur wheat, and stuffed with more meat. Other common preparations include a layered baked "pie" or a steak tartare raw version called kibbeh nayye. Anyway you make it or say it kibbeh leaves a permanent flavor imprint on your senses.